If you are curious about digging deeper into Swedish culture, it’s surprising how much you can learn from a stroll in Stockholm’s Norra Begravningsplatsen. For centuries, the main burial site for the population of Stockholm was inside a cavernous crypt located under Storkykan Cathedral in Gamla Stan. By the beginning of the 19th Century the crypt had become fully booked and a decision was made to create a large cemetery located outside the city limits, both for sanitary reasons but also to plan ahead for the growing population of Stockholm. The cemetery opened in 1827 and would later expand as the population grew. 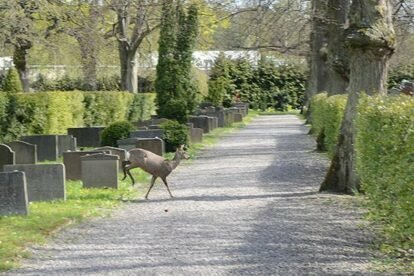 Gustav Lindgren, Gunnar Asplund Sigurd Lewerentz and Lars Israel Wahlman were some of the architects, who over time created one of Sweden’s most notable and impressive cemeteries. Some fine sculptures can be found here as well, notably works by both Carl Milles and Carl Eldh, two of the country’s most celebrated sculptors. Incorporated within the Northern Cemetery grounds, one also finds the Catholic and Jewish cemeteries run by their separate administrations. Norra Begravningplatsen hosts its fair share of Swedish celebreties. Looking for the final resting place of Sweden’s literary giant August Strindberg? Alfred Nobel who left us the Nobel Prize or actress Ingrid Bergman? You can easily find their graves using this website. Why not plan a visit to this beautiful spot and avoid being haunted for the rest of your life for having missed out on one of Stockholm’s lesser known attractions?